The last of the summer tomatoes seem to be trickling into my house. Not from my plants. I’m too soft to end the lives of the cute little slug-like snail creatures eating all my tomatoes. The only crops around here come from my CSA or my mother’s garden. Feeling sorry for the tomato loving bugs has proved once again to be a terrible way to raise productive plants. I must be strong and firm next year. It’s their lives or mine! Or, I could just rob the tomatoes out of mom’s garden. Why do I try to grow tomatoes anyway? I don’t think I’m cut out for the cruelty of gardening. Very soon I’ll be missing these colorful, tasty late summer vegetable pizzas. Preheat the grill on high to 500 degrees, with the lid closed. Brush a good quality pizza pan lightly with olive oil, and sprinkle with cornmeal. Set aside. Place chopped tomatoes on a paper towel lined plate. Sprinkle with salt and pepper and cover with a paper towel to drain. Stretch and roll out the pizza dough until thin, and place on the pan. Brush the top with 1 tablespoon olive oil, and spoon on as much pizza sauce as desired. Pat the liquid out of tomatoes. Top pizza with the mozzarella, Asiago, zucchini, tomatoes, onions, minced garlic and Parmesan. Sprinkle with salt, pepper and onion powder. Drizzle top with a little basil olive oil. Set pizza on the grill and close the lid. Cook for 5 to 8 minutes or until cooked through and bottom of crust is browned. Place the rest of the ingredients in the bowl and knead with a dough hook on low speed for 5 to 10 minutes. Remove the dough from the bowl and knead by hand on a clean surface for another minute. The recipe makes enough sauce to cover three medium, or two large pizzas. Makes 1½ cups of pizza sauce. Notes: Because this recipe is so quick to prepare, I keep extra tomato sauce and tomato paste around for spur of the moment pizza nights. 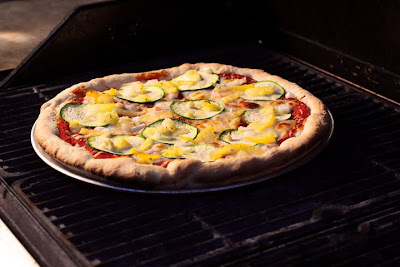 So tomorrow is my one year bloggiversary and I was actually thinking of doing grilled pizza! This looks amazing. I have to say thanks for giving me tips and inspiration throughout this whole year and that it has been such a pleasure to read your blog. Dawn you've really been blogging and sharing your beautiful food with us for a whole year? Where has the time gone? Happy anniversary my friend! Lovely recipe, KILL THE BUGS...and dont look back lady! Your pizza is lovely! Just when I think I can't eat another tomato or zucchini, along comes a recipe like this one, to tempt me all over again. I made your (Uncle Will's) molasses cookies- The dough was sticky so when I rolled them out I used lots of flour. I don't think I got them quite as thin as yours, so I baked them a bit longer. They're delicious and well worth the trouble of the sticky dough! Thanks! PS (as if this wasn't long enough) There's a link to the gougeres recipe near the bottom of my post. In my book, pizza should always have a lot of garlic and a lot cheese. Veggies are mandatory too. So needless to say, this pizza is a winner for me. Thank you for sharing, Laura. It looks amazing...I only wish those summer vegetables would last a bit longer! The cruelty of gardening! You make me laugh so hard! yum i love grilled pizza. just as good as woodfired ones. this looks delicious! Just in time for Friday night. Beautiful! I love that you've flavored the crust and the veggies sound great, too. Was just thinking about making pizza since it's been a while.